If you watch only one SpiceMaster movie, see this. It shows many uses of SpiceMaster's custom soft/organic transitions. It also shows compelling examples of how spices can softly/organically animate your video editing software's OTHER effects (built-in or third-party plugins) within a single clip. Throughout the movie are soft/organic title effects from SpiceMaster PRO. Plus a cool example of the PRO version's soft/organic picture-in-picture (PIP) effects. Enjoy! 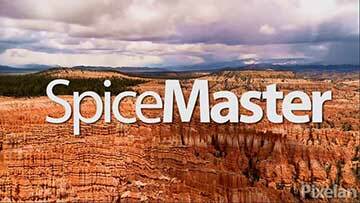 This seven-minute SpiceMaster movie presents all of the brief examples below on this page. SpiceMaster has long been known as the leading soft/organic video transitions plugin. However, the plugin is ALSO terrific for custom title effects AND softly/organically animating OTHER video effects within a SINGLE clip, such as color changes, blurs, etc. within a scene. This movie shows what we mean in real-world editing situations. Enjoy!